Cindis World: Decorative wooden bench $6.22 shipped !! Decorative wooden bench $6.22 shipped !! Collectionsetc.com has this decorative bench for $6.22 shipped when you use code 3G9262 . Display your favorite plants, dolls, and more on the best seat in the house. 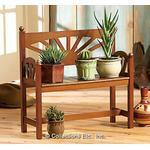 Southwestern inspired bench-style shelf is crafted of wood and features a rising sun "backrest." Crafted of wood with a dark maple finish. For indoor use only; supports 10-lbs. maximum. Assembly required. 23 3/4"H x 24"W x 9"D.
Go HERE and grab one before they sell out!